I stumbled upon this girl tonight. It took me by surprise for a minute because she looks so thin. And I know in her heart she was hurting right at that moment because she felt horrible and ugly and huge. I know she had that sassy flower in her hair and a pretty necklace on to make herself feel better. I know she probably spritzed herself with a nice perfume as well. 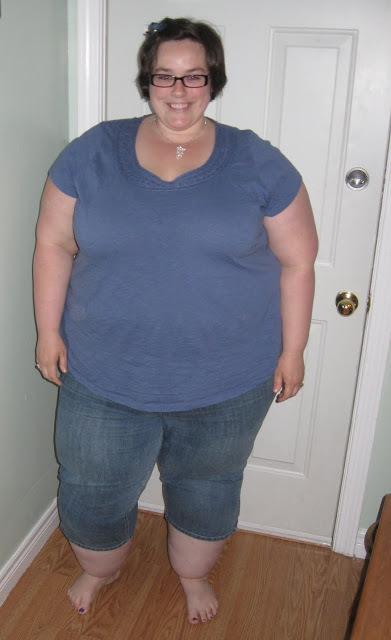 Even though she is smiling in this picture, I know it took her all she had in her to stand there and take a full body picture. For everyone to see – ALL of her. I know because I am her. I wish I could go back in time for a moment to give this girl a hug. To tell her that she was beautiful, because as I look on this photo right now, I realize that she is. I wish I could tell her that even though it is going to be hard, long wait for answers and validation, it will come. And when it comes, that it won’t even really matter because she’s placed all she is and all she has in her Father’s hands. I wish I could tell her to throw out those jeans that she was keeping in her closet, just hoping they would one day fit again. Because they’re never going to fit (and that’s okay). I wish I could tell her that even though her body will start to fall apart, her heart won’t. I wish I could tell her to rock those capris because one day, she won’t be able to wear them anymore. I wish I could tell her that when she writes this, almost a decade later, that she will be several sizes larger. But also if one could measure happiness, that she’d be rich. I wish I could tell her that she is going to be okay. I also stumbled on this girl tonight. And she made my heart happy. That smile. She has no idea what is coming. No idea about the mean girls who will rob her of the joy illuminating her face. She doesn’t yet know the nights she’ll cry herself to sleep because she’s been put down for her weight. She doesn’t yet know how much her heart will ache when people laugh as they pass her by. I wish I could visit this girl, just for a moment. I would take her by the hand and tell her she’s beautiful. I would tell her how jealous of her beautiful curly hair I am. 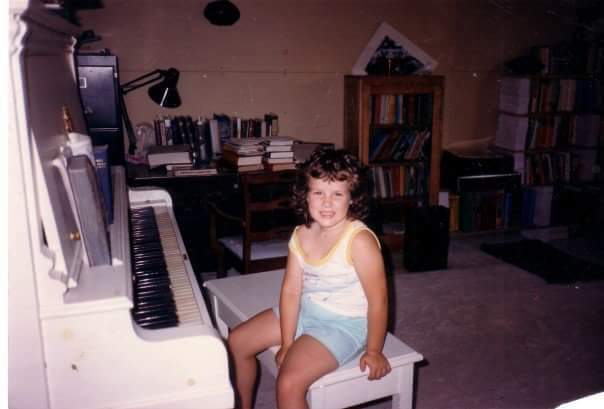 I would tell her to stick to her piano lessons because she’ll regret giving up. I would tell her to keep singing with her whole heart. And I would tell her to listen to her mother and write until her wrists ache. I’d tell her to hold on to that joy with everything she’s got. I wish I could wrap my arms around this little girl like a shield. I wish I could protect her heart from all the painful experiences I know would come. I wish I could make her heart impenetrable, so it wouldn’t hurt so much. But I can’t. And maybe I don’t want to. Because sometimes having a wide open, vulnerable heart is a good thing. It means it can be wounded badly. But it also means it can be easily filled. Having a wide open heart means its open to anyone who needs it. Like the black girl that no one wanted to play with at recess. Like the boy who had a lisp. Like the girl who hurled insults at her every chance she got. Sometimes the journey God allows in your life can hurt. Sometimes the pain can be overwhelming. One thing I’ve learned on my journey is that the tongue is as sharp as a sword and words can crush your soul. But the other thing I have learned? It is equally as important. I’ve learned that holding onto those words is like repeatedly swallowing poison, but forgiveness is healing. And for every deep cut painful words can make, God’s love goes even deeper, restoring and bringing peace. I wish I could go back to these two and give them hope. 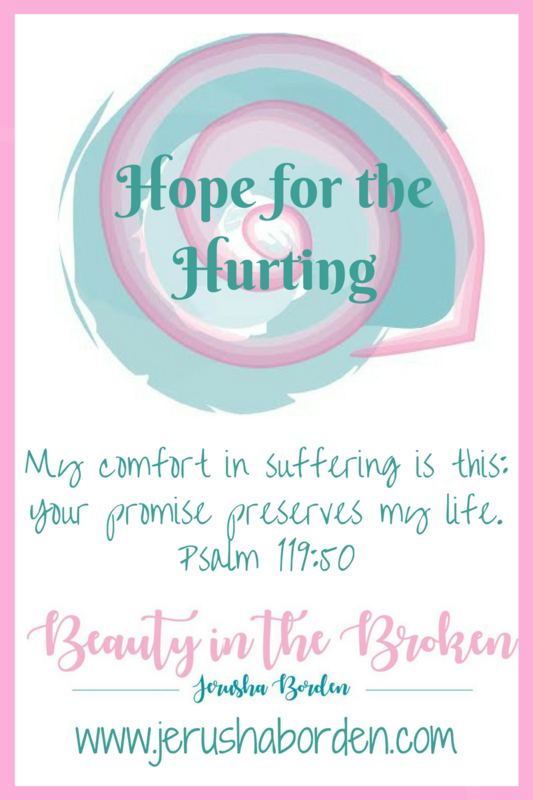 Because hope is the healing thread that sews my broken heart together. The wounds that these two have suffered have left behind scars. But those scars? They’re beautiful. They tell a powerful story of love, suffering, redemption, and fountains of hope. The time has come to share my story in bits and pieces, fragments of a life I’ve lived and am still living. And how I’ve been given the gift of sifting through to find beauty in the broken. God's love goes even deeper…I love this. Thank you for sharing your journey. There is so much hope and encouragement in your words. What a beautiful, transparent piece. Thank you for sharing from your heart – and encouraging each of us to embrace each step of the journey we are on because God is the author of our stories! Jerusha – I love how open you are here. You are not alone, many of us struggle to learn that our worth and beauty are not determined by those around us but by God who created us and gave us what we needed to be beautiful. Each of us as He made us. Good job! Thank you for sharing and being so vulnerable with us. You are beautiful inside and out! The victory is ours in Christ and your story is still unfolding. I can't wait to read more. Jerusha, this post brought me to tears. Thank you for sharing your beautiful heart with us. Sometimes I wonder if the one thing we all have in common is “the hurt”. Thank you for being transparent and sharing your story. Thank you for being so vulnerable by allowing us into your life and who you are.